Exorcism (from Late Latin exorcismus—to adjure) is the practice of evicting demons or other evil spiritual entities from a person or place which they are believed to have possessed. The practice is quite ancient and still part of the belief system of many religions. The person performing the exorcism, known as an exorcist, is often a priest, shaman, or an individual thought to be graced with special powers or skills. In general, possessed persons are not regarded as evil in themselves, nor wholly responsible for their actions. The concept of possession by evil spirits and the practice of exorcism originated in prehistoric shamanistic beliefs. In Hinduism, the Vedas (holy books of the Hindus) include sacred spells needed to cast out demons and evil spirits. Several examples are found in the Hebrew Bible, and the New Testament includes numerous exorcisms among the miracles performed by Jesus. 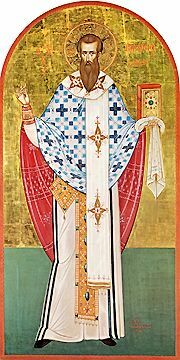 Today, Catholicism, Eastern Orthodoxy, and some Protestant sects recognize the practice. In recent times, the practice of exorcism has diminished in its importance to most religious groups and its use has decreased. This is due mainly to the study of psychology and the functioning and structure of the human mind. Many of the cases that in the past which were candidates for exorcism are often explained to be the products of mental illness, and are handled as such. Exorcism is a popular fictional theme, with the bestselling 1971 novel, The Exorcist by William Peter Blatty), being a prime example. The concept of possession by evil spirits and the practice of exorcism are very ancient and widespread. In shamanic healing, exorcism is needed when a negative entity, called a demon in Western society, takes hold of a person's soul. When a shaman performs an exorcism, the demon may try to engage the shaman in conversation, reveal secrets that the shaman may be ashamed of, or use physical, energetic, and telekinetic attacks against the shaman. The only thing that will protect the shaman is her firm connection to, and faith in the power of her divinity or spiritual gift. Exorcizing demonic forces is central to native Chinese religious culture. Taoism, which emphasizes the maintenance of harmony in the world, has blended with shamanistic beliefs and practices among the Chinese peoples. Thus, the shaman may enter into a spiritual trance as a way of establishing the connection between the forces of light and darkness—yang and yin—that are necessary to promote healing and wholeness. Historically, one way that people in China dealt with demons was through ritual performances that summoned martial deities from a celestial bureau called the Thunder Department (lei bu). These performances have been used to exorcise demons blamed for causing individual illnesses, epidemic outbreaks, irregular patterns of rainfall, and other disorders in the world. By marshaling the powers of thunder in these Thunder Ritual systems (lei fa), ritual practitioners (shamans) turned to celestially sanctioned forms of violence to rid the world of disruptions of order and set the world aright. And Eskimo (Yupik) shaman exorcises demons from a sick boy. Korean shamanism encompasses a variety of indigenous beliefs and practices that have been influenced by Buddhism and Taoism. In contemporary Korean, a shaman is known as a mudang (무당, 巫堂). The role of the mudang, usually a woman, is to act as an intercessor between God or the gods and human beings. Shamans hold services to cure illnesses by exorcising evil spirits, propitiating local gods, or offering sacrifices to liberate a person's ancestors. Korean shamans are similar in many ways to those found in Siberia, Mongolia, and Manchuria. They also resemble the yuta found on the Ryukyu Islands, in Japan. Cheju Island off South Korea is also a center of shamanism. Native American shamans use purifying rituals to cleanse the body. The healer focuses on using spiritual healing powers to treat people with illness based on the idea that spirits have caused the illness. The smoke of the sage plant is believed by some to exorcise evil spirits from an area to help create a sacred space. Because some illnesses are believed to come from angry spirits, healers may also use special rituals to appease or exorcise the angered spirits. Another practice of Native American shamans—symbolic healing rituals—can involve whole communities. In Africa, shamans (called witch doctors because of the supposed ability to combat witchcraft), often perform exorcisms to cure people of various maladies. In Southern Africa, in the Zulu, Swazi, Xhosa, Sotho, Tswana, [[Venda], and Tsongo/Shangaan traditions, such a shaman is known as a Sangoma. 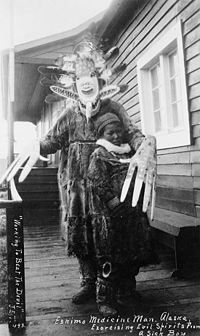 In African tribal culture, the devil is said to sometimes target children. In a number of regions of Africa, there is a strong belief that witches indeed exist. Chants and ritualistic formulas are used to drive out the demons. However, sometimes violence is used for deliverance. In some cases peppers may be rubbed in the child's eyes, or they are threatened with drowning in an attempt to drive out the evil spirit. In Hindu tradition, beliefs and practices pertaining to the practice of exorcism are prominently connected with the ancient Dravidians in the south. Of the four Vedas (holy books of the Hindus), the Atharva Veda is said to contain the secrets related to magic and medicine. Many of the spells described in this book are for casting out demons and evil spirits. These beliefs are particularly strong and practiced in West Bengal, Orissa and southern states like Kerala. The basic means of exorcism are mantra and yajna used in both Vedic and Tantric traditions. Vaishnava traditions also employ a recitation of names of Narasimha and reading scriptures (notably Bhagavata Purana) aloud. The main Vedic resource on ghost- and death-related information is Garuda Purana. The arrival of Buddhism absorbed and reinforced shamanism. Buddhism teaches the need to attain moral perfection through a series of reincarnations in order for a person to experience nirvana—absolute peace and absolute nothingness. Buddhism is strongly shamanistic in its popular versions. Shamans are especially active in Tibetan Buddhism. A large number of Buddhist exorcists work in Japan. A Buddhist exorcism is performed by a temple's chief priest and his assistant, reading an appropriate sutra (the scriptures of Buddhism) and burning a special incense. The priest also carries a shakujo—a wooden staff with metal rings threaded onto it, creating an unearthly sound to scare evil spirits away. In some Buddhist traditions, spirits are driven out of a person's body by causing physical discomfort such as fasting, bathing in extremely cold water, or slapping the skin of the possessed person. 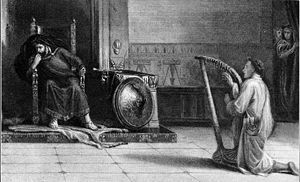 David plays his harp for King Saul, causing the "evil spirit from the Lord" to leave him. Exorcism in the Old Testament is rare. However, a famous instance of its practice is the story of David's acting as King Saul's harper when Saul was beset by an "evil spirit form the Lord." According to 1 Samuel 16:23 "Whenever the spirit from God came upon Saul, David would take his harp and play. Then relief would come to Saul; he would feel better, and the evil spirit would leave him." In the apocryphal Book of Tobit, the beautiful young woman Sarah is plagued by a demon who has killed all seven or her husbands on her wedding night. She is liberated from this curse after the hero of the story, Tobias, is instructed by the angel Raphael to drive away the demon when he attacks on his wedding night by burning a fish's liver and heart. Raphael follows the demon to Upper Egypt and binds him there. Around the first century C.E., Jewish sources report of exorcisms done by administering drugs with poisonous root extracts or by making sacrifices. (Josephus, "B. J." vii. 6, § 3; Sanh. 65b). Exorcisms were reportedly done by the Essene branch of Judaism (Dead Sea Scrolls at Qumran). Jesus of Nazareth was a powerful Jewish healer and exorcist, and was apparently not alone in this profession, as evil spirits were believed to be the source of much illness. In kabbalah and European Jewish folklore, possession takes on a different (and often much more positive) context. A person may be possessed by a spirit called a dybbuk—which is believed to be the dislocated soul of a dead person—returned from Gehenna (a Hebrew term for the in-between world or purgatory that all spirits go to before entering heaven. According to these beliefs, on rare occasions a soul which has not been able to fulfill its function in its lifetime is given another opportunity to do so in the form of a dybbuk. The soul then seeks out and "attaches" itself to a living person who is going through things or in a similar "life position" to what the soul was in during its lifetime. It is believed there are good dybbuks and bad, with a good dybbuk's "attachment" performing more the role of a "spiritual guide" there to help the person through their current trials and tribulations. In the case of a negative dybbuk, the spirit is not there to help as much as cause the same mistakes and chaos that it originally experienced during its own lifetime. Exorcism involves 10 people (including the rabbi) who surround the possessed individual. The rabbi that leads the ceremony also requires a shofar (a ram's horn trumpet). The group repeatedly recites Psalm 91 and then the rabbi proceeds to blow the shofar in a specific pattern. This "shocks" both the possessed and the possesser, causing a loosening between the two enabling the addressing of each individually. The rabbi then enters in to dialog with the spirit to find its purpose, and the group proceeds to heal it through dialog and prayer meant to have it feel it has accomplished its goal. This is also done for a person who is possessed. Painting by Francisco Goya of Saint Francis Borgia performing an exorcism. Jesus is portrayed in the New Testament as the premier exorcist of his time. As much as one-quarter of Jesus' many reported healings were exorcisms. At times, Jesus cured the sufferers by the mere touch of his hand (Mark 1:25), or by the use of spittle put upon the affected organ, accompanying the operation with a whisper, Mark 8:23. He even drove a whole legion of evil spirits, 2,000 in number, out of a maniac living in a cemetery and made them enter a herd of swine to be drowned in the adjacent lake (Luke 8:26-39). Mary Magdalene was famous for being exorcised of seven demons, although it is not clear that Jesus was the exorcist in this case. The ability to cast out evil spirits was also a sign of true discipleship among the apostles. Thus, exorcism became an important part of the tradition of the early Christian church, and many exorcisms are reported in early Christian literature. Solemn exorcisms, according to Catholic Church law, can only be exorcised by an ordained priest (or a higher prelate), with the express permission of the local bishop, and only after a careful medical examination to exclude the possibility of mental illness. Symptoms listed in the Roman Ritual as being indicators of possible demonic possession include: speaking foreign or ancient languages of which the possessed has no prior knowledge, supernatural abilities and strength, knowledge of hidden or remote things which the possessed has no way of knowing, an aversion to anything holy, profuse blasphemy, or sacrilege. The Catholic Church revised the Rite of Exorcism in January 1999, although the traditional rite is allowed as an option. The act of exorcism is considered to be a dangerous spiritual task. The ritual involves prayers, blessings, and invocations often with the use of the document Of Exorcisms and Certain Supplications. One example of the contemporary Church's view on exorcism is that of Emmanuel Milingo (born June 13, 1930), who was consecrated by Pope Paul VI as the Archbishop of Lusaka, Zambia in 1969. Milingo's work as an exorcist began gradually after his priestly ordination, but only in 1973 four years after his consecration as archbishop did he become well-known, due to the instantaneous recovery of an apparently mentally ill woman over whom he had prayed. Eventually, his healing services were attended by large audiences. However, he was asked in 1983 to step down from his position for his performance of exorcisms and faith healing practices were unapproved by higher Church authorities. In the Church of England, every diocese has an official exorcist, who will usually be an elderly priest and from the Anglo-Catholic wing of the church. In The Episcopal Church the Book of Occasional Services discusses provision for exorcism; but it does not indicate any specific rite, nor does it establish an office of "exorcist." Diocesan exorcists usually continue in their role when they have retired from all other church duties. Anglican exorcisms sometimes take the form of a mass for the dead if it is suspected that the souls suffering in Purgatory are responsible for the disturbance. Like their Catholic counterparts, Anglican priests may not perform an exorcism without permission from the Diocesan (regional) bishop, and a medical evaluation is also involved. 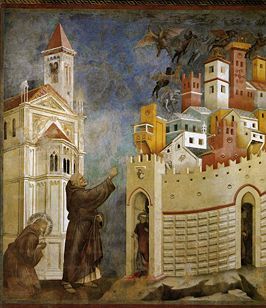 O God of gods and Lord of lords... Grant that this my exorcism being performed in Your awesome name be terrible to the Master of evil and to all his minions who had fallen with him from the height of brightness. Drive him into banishment, commanding him to depart hence, so that no harm might be worked against Your sealed Image. And, as You have commanded, let those who are sealed receive the strength to tread upon serpents and scorpions, and upon all power of the Enemy. For manifested, hymned, and glorified with fear, by everything that has breath is Your most holy Name: of the Father, and of the Son, and of the Holy Spirit, now and ever and into ages of ages. Amen. Some Protestant denominations also recognize possession and exorcism, although the practice is generally less formalized than it is in the Catholic Church. 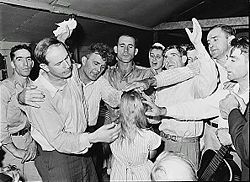 While some denominations perform exorcism very sparingly and cautiously, some may perform it almost routinely, as part of regular religious services (especially Pentecostal denominations). Some denominations hold that any Christian have the authority to perform exorcism, not just the clergy. In some traditions, a test which is often used to determine whether a mental disturbance is psychological or spiritual in nature is to pray over the person for the healing of their affliction and throw holy water on them. If the person reacts violently or uncharacteristically in response to prayer in the name of Jesus, it is often taken as a good indication that the affliction is demonic in nature. Exorcisms are common in some traditions in which faith healing is practiced. They sometimes involve dramatic phenomena such as the possessed person shouting, falling on the floor, or violently shaking before the spirit is supposedly driven out by the combined power of the exorcist and the Holy Spirit. Possession by evil spirits (jinn) or the Devil (Shaitan) and exorcism of those who are wicked at heart is warned about in Islam. The jinn enters a person and may cause him to speak incomprehensible words, and gives him supernatural physical power. Many members of the Islamic clergy caution against the overuse of exorcism, citing that most cases are due to psychological and physical causes mistaken for possession. 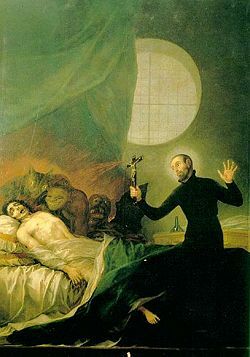 Real cases of possession are considered rare, and the faithful are warned to beware of exorcists who diagnosis possession too quickly, as they may merely be seeking profit. Islamic authorities also deny the possibility of possession by souls of deceased persons, and warn that evil spirits may make this claim in order to encourage sinful behavior among the living. In Sikhism, exorcism is not permitted and is seen as a violation of the Sikh Rehat Maryada (Code of Conduct), since Sikhs do not believe in demons, ghosts, or the sort. If a Sikh person were to be found practicing exorcism, an ordained Ghiyanhi (priest) would have the power to strip that individual of any ties to the Sikh faith. Jainism also does not believe in exorcism. Exorcism has been a popular subject in fiction, especially horror. The Exorcist (1973 and 2000 movies), and its sequels and prequels, were inspired by Catholic exorcism ritual and folklore. Constantine (2005 movie) is based on the DC/Vertigo comic book Hellblazer. The Exorcism of Emily Rose (2005 movie) was inspired by the Anneliese Michel case. Requiem (2006 German-language movie by Hans-Christian Schmid) is based on the Anneliese Michel case. This page was last modified on 9 August 2017, at 17:55.